Artisan Restaurant Collection is a boutique, niche contract foodservice restaurant offer created in the field by chefs. Artisan was imagined and developed in California by a market need for local, sustainable, chef-driven farm-to-fork food created with love. We have an unparalleled infrastructure uniquely capable of nimble creativity and innovation, unlike traditional foodservice offers. We are committed to providing real food with pronounceable ingredients, made with care by our Artisans who take their crafts very seriously. We are sustainable. We are lovers of food and believers in goodness. 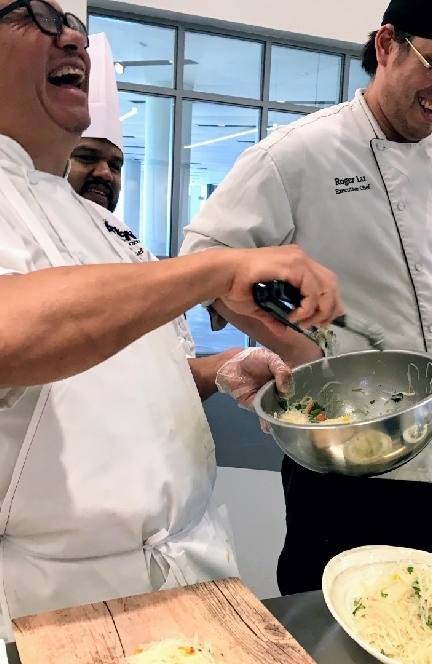 Our Executive Chef Collective - our Chief Artisans - reach locally to foster a highly fine-tuned barometer of the tastes and nuances of the culinary drivers in the communities we serve. Our teams develop highly innovative, farm-fresh, deliciously rotating food programs specific to these local flavors, menuing seasonally to remain on-trend and cutting edge at the height of freshness. Join us! We look forward to serving you and sharing our passion for food. Experience the difference with Artisan Restaurant Collection. culminate to an undeniably different solution to onsite café services.